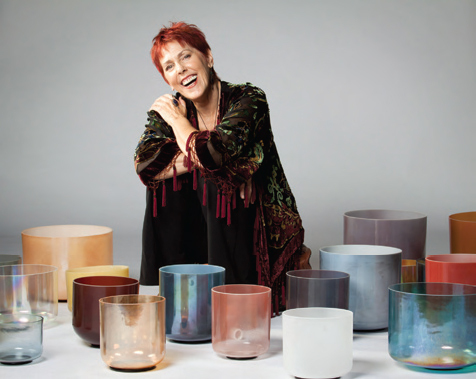 “Acoustic luminescence … Womb-like immersion .., Ecstatic stillness … Mystic soundscapes!” These are just a few of the phrases that immediately come to mind when describing the brilliant resonance of the Crystal Tones Alchemy Crystal Singing Bowls. 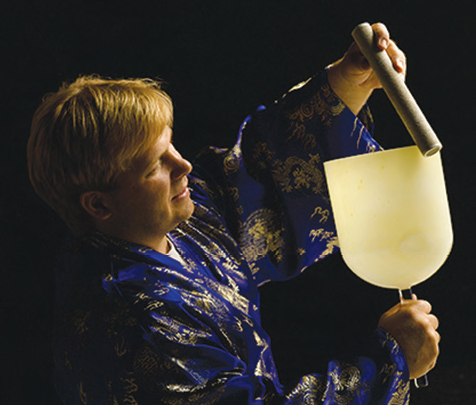 These are not your ordinary singing bowls. They are escorts beyond the ordinary to a state of awareness, a sound world that defies description. They are the quantum tool of this crystalline age. As a recording artist with Sounds True and Harmonic Sound Healer, I am most fortunate to be able to work with the crystal sound power of these amazing bowls. I actually consider them as medical devices as well as rare musical instruments. Both aspects enrich my work directly. With 25 years of practice and performance, I’ve found no other bowl can parallel the tonal purity, the refined harmonic spectrum and the direct alignment to cellular and universal harmony than these bowls. They continue to amaze me! While in the presence of their tones one feels a deep shift from the mundane to the mystical. I know, that’s a strong statement, but I’ve tested pretty much every crystal bowl available, and no other singing bowl has been able to penetrate and reconfigure all states of being like these Alchemy Crystal Singing Bowls. I will only use these bowls. Refined tone, grace and beauty are their most accessible qualities…and there is so much more. Now more than ever we seek harmony in our lives. These evolutionary times call for profound shifts at every level and the Crystal Tones Alchemy Crystal Singing Bowls are here to serve. "Alchemy Crystal singing bowls have created astounding results by engaging students from preschool to college. Research proves that playing bowls improves concentration, creativity and lowers anxiety before testing, resulting in higher test scores and retention. This can be explained by the brainwave entrainment effects of the bowls through their binaural beats. "Binaural beats are like auditory illusions…" they trick the brain into the desired brainwave state." With more research being verified all the time about the health benefits of music, drumming, and meditation, it is becoming more apparent how such practices are important to our health and vitality. With the Crystal Tones crystal bowls, one takes vibration, thought and the energy of different minerals to create a positive healing effect upon the body. With the body being over 80% water, the crystal bowls will re-pattern and re-structure the water of the body. The crystal bowls are made from a base of quartz. The bowls I will have with me are called alchemy bowls as they have other minerals either mixed in or adhered to the quartz. Quartz is silicon dioxide, and within the body, there is a good amount of silica-particularly within the fascia, which will create a resonant frequency with the crystal bowls. The crystal bowls will alter the water of your body, affect your sacred geometry, your DNA, as well as energy blockages, meridians and chakras in a positive way. Many people are aware of Rife machines, radionics, or Dr Emoto’s work. Thoughts, emotions, illness all have a frequency with which they are connected. The Crystal Tones crystal bowls vibrate high on the frequency scale and help one leave behind lower emotions, toxicity and other things that are non-beneficial to one’s body and amazing new dimensions when several years ago I was led to take a workshop with William “Lupito” Jones, the creator of the beautiful Alchemy Crystal Singing Bowls I now play. These bowls are particularly beautiful high vibration instruments that combine color and gemstone frequencies with the sonic qualities of quartz crystal singing bowls. The special processes used to create these Alchemy Bowls from Crystal Tones yield sonic qualities and a purity of tone that causes them to easily and powerfully resonate in harmony with our cellular structures. In my years of study and practice I have found no other singing bowls that compare to the vibrational qualities, purity of sound and power of those made by Crystal Tones, and I now exclusively work with their Alchemy Bowls. "Crystal bowls have been a tremendous benefit to in my practice to help people achieve a state of calm & peace in a natural way." "I've used it for many stress-related conditions including anxiety, OCD & PTSD with great results"